USAID also stimulates innovation on certain critical topics with Grand Challenges for Development, which offers prizes for breakthrough solutions that address Ebola, off-grid energy, irrigation, power for agriculture, and other issues. The competitions are open to engineers, organizations, and companies worldwide. The Powering Agriculture challenge, which is also supported by Germany, Sweden, and North Carolina-based Duke Energy, attracted 1,346 applications in two rounds, with 24 winners receiving $500,000 to $2 million each to further develop their ideas. Ryan Shelby, a mechanical engineer by training, leads USAID’s Powering Agriculture team. He wants to see several of the technologies funded in this crowdsourcing effort reach commercial scale, with at least $1 million in revenues. “We want to benefit not tens of people but tens of thousands,” Shelby says. At the Nov. 20, 2015 Powering Agriculture Innovator Showcase in Washington, D.C., the 2015 Innovator Cohort was introduced to the world. 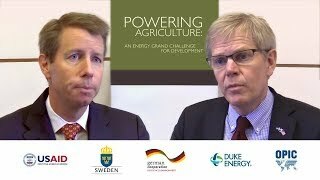 Hear what the Founding Partners, Innovators and guest speakers had to say about Powering Agriculture: An Energy Grand Challenge for Development. In developing countries, three out of four people living in poverty have incomes tied to agriculture. Powering Agriculture is finding clean energy solutions to help them. Hear some of the voices of Powering Agriculture from Kenya, where only five percent of farmers have electricity. Millions of farmers in developing countries have no, or poor quality, grid power, limiting the productivity needed to feed growing populations and farmers out of poverty. 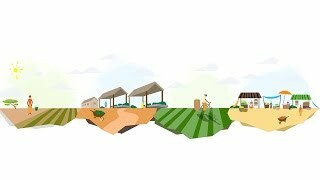 To address these barriers to development, the Founding Partners have created Powering Agriculture.